Regular Email Campaigns: What is Email Delivery Throttling? What exactly is email throttling? Email throttling – splitting a campaign into several batches to send over a longer period of time to avoid heavy data traffic issues. Why do I need to use email throttling? When you slow down your campaign by delivering it in batches you are able to control the number of email messages sent at once. This is important in terms of deliverability because, if the campaign is too heavy, there is a higher chance to get blocks form ISPs (Internet service providers). Some ISPs limit the number of emails they accept from a particular sender during a specified period of time. If you try to send a campaign above their acceptable threshold, they will reject your emails resulting in a high number of bounces. Is it necessary/mandatory for me? 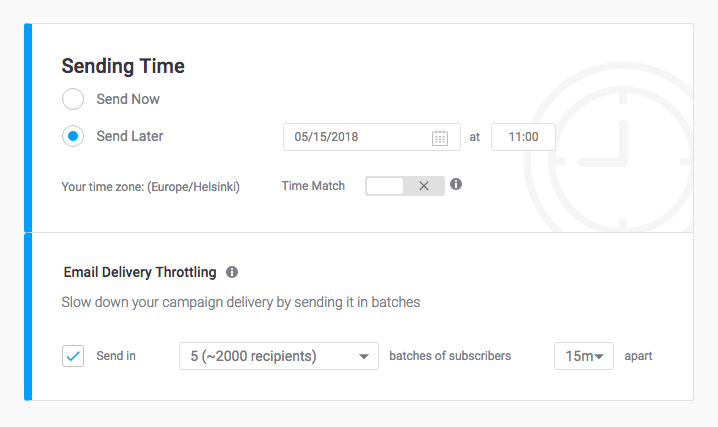 If the total size of your campaign (the number of campaign recipients multiplied by the size of one email) is 100GB or more – we automatically activate email throttling for you, which cannot be disabled. If the campaign size is less than 100GB, you can choose whether or not to activate it. Email throttling can help you spread out the delivery of your messages to avoid ISP blocks. If your campaign contains a CTA (Call To Action) button or any other user interaction, you will probably receive some kind of response from your clients - let it be phone calls, replies on the email or visits to your website. Splitting the campaign delivery into batches enables you to handle these incoming responses in a more efficient and controlled way. You can control server bandwidth to your website, for example, when there are active sales or promotions happening. If you are sending your campaign using a new dedicated IP, then you will need to “warm it up”, in which case email throttling is a perfect way to do that. This should be discussed with a delivery team member. If your entire campaign needs to be sent immediately, for example, if you are announcing a 24h promotion, this could be an obstacle for you. How to enable email throttling? 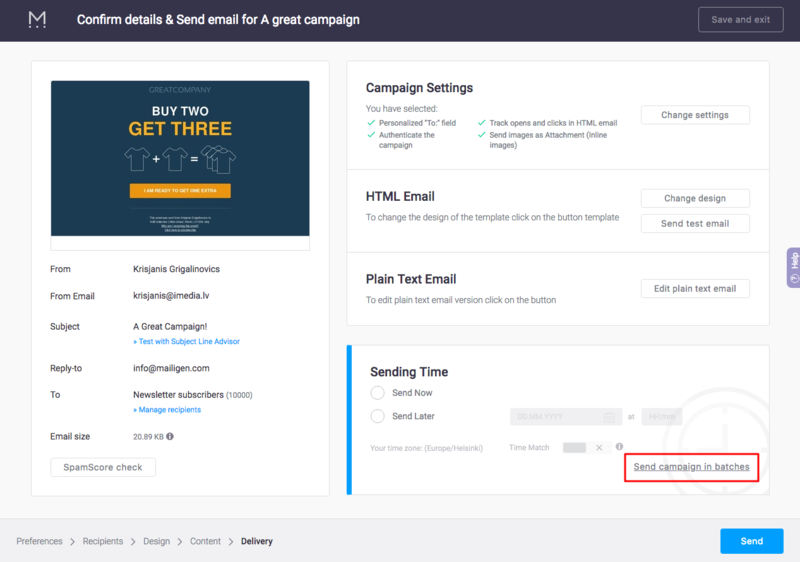 Step 1 - on the 5th (Delivery) step of creating a campaign you will see either an option "Send campaign in batches" (the total size of your campaign is less than 100GB) or the automatically added email throttling option (the total size of your campaign is more than 100GB). Note: Your list has to contain at least 1000 contacts to activate email throttling, otherwise you won't have the option. Step 2 - tick the box, choose in how many batches you would like to send the campaign and the time interval between sending of the batches. Note: The throttling feature isn't available if you are using "time match" option. Step 3 - wait for the campaign process to be completed and check the reports. The full report won't be available while the campaign is in the process of sending. How to disable email throttling for campaigns larger than 100GB? remove large images and any attachments etc. The goal is to reduce the size of the total campaign to less than 100GB.